This article submitted by Zac Spates on 2/23/99. The Paynesville wrestlers traveled to Albany to take part in the Section 5AA Individual Tournament Friday, Feb. 19. Thirteen wrestlers watched their weight throughout the week to take a chance at going to state individually. All 13 wrestlers weighed in, got skin checks, fueled back up, and waited intently to see who their first match was against. In the first round, two Bulldogs wrestled; the other 11 had byes, according to what they were rated. Josh Schreifels, one of the two Paynesville wrestlers in the first round, faced a tough wrestler from Rocori and was decisioned 4-1. Schreifels went into the wrestlebacks. Matt Brauchler faced an Annandale wrestler and pinned his opponent in five minutes. With the first round quickly finishing, many wrestlers were getting ready for their first match. As the second round started, Nathan Glenz was the first to represent Paynesville. Nathan Glenz, the third seed, went out against a New London-Spicer wrestler. Nathan decisioned his opponent to advance to the semi-finals. At 112, Bryan Kotten wrestled the second seed in the tournament. His opponent was too tough and he was caught on his back in the first period. Bryan was now in the wrestlebacks. Jeremy Sogge, seeded third, wrestled at 119 and lost a very painful match to a Sauk Centre opponent. Jeremy also went into the wrestlebacks. At 125, David Kerzman made quick work of his opponent and recorded a technical fall in 5:00. At 130, Josh Schreifels wrestled a tough opponent from Albany and lost by a decision. This second loss removed Josh from the bracket. Justin Mueller pinned his opponent at 135, advancing himself to the semi-finals. 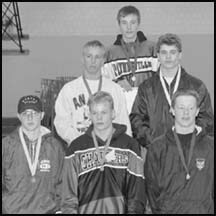 Mueller was the only Paynesville wrestler to be seeded first. At 140, Chris Welle, left, scored a technical fall against his opponent, and at 145, Joe Hiltner pinned his opponent to advance himself along with Welle to the semi-finals. Welle was seeded second and Hiltner was third. Chris Sogge recorded a major decision over his first opponent. Sogge was seeded second in the tournament. Shaun Fleischhacker wrestled at 160, and pinned his first opponent in 50 seconds. Fleischhacker was seeded fourth. 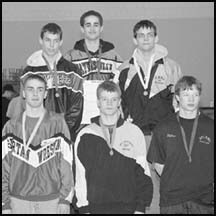 Sanborn, pictured at top, and Bork wrestled at 171 and 189. Both defeated their wrestlers in their first round of the tournament, advancing themselves to the semi-finals. Sanborn was seeded second, and Bork was seeded fourth. Brauchler went out at heavyweight for his second match of the night. Brauchler faced the number two seeded wrestler and wrestled tough against him. Unfortunately, he was caught in the latter half of the first period on his back. Bryan Kotten wrestled in the third round for Paynesville. This round was the wrestlebacks and he pinned his opponent in 45 seconds. At the end of three rounds, the wrestlers were able to leave the school and go home on Friday night to prepare for the second part of the tournament on Saturday. On Saturday, Feb. 20, the wrestlers traveled back to Albany to finish what they started the day before. In the first round, the winners of the previous night wrestled for their spots in the finals, wrestlebacks for some wrestlers were also going on in this round. At 103, Nathan Glenz went out against the second seed in his bracket and lost in a close match. This brought Glenz to the wrestlebacks. Bryan Kotten wrestled his fourth match and was decisioned by a Sauk Centre opponent. This second loss took Kotten out of the tournament. Jeremy Sogge went out against a Melrose opponent in this round and made quick work of him. Sogge pinned his opponent to advance him further in the wrestlebacks. David Kerzman and Justin Mueller defeated their opponents in the semi-finals to advance themselves to the finals. Chris Welle also advanced with a technical fall over his Sauk Centre opponent. Joe Hiltner wrestled the second seed and lost in a close match to a Litchfield opponent. At 152, Chris Sogge, right, pinned his opponent to advance him to the finals. Shaun Fleischhacker wrestled a very tough opponent and lost to the defending two time region champ. Karl Sanborn decisioned his opponent, making him the fifth wrestler in the finals for Paynesville. Josh Bork wrestled a tough Dassel-Cokato wrestler and lost a close match with the end score of 6-2. Josh was now in the wrestlebacks. At heavyweight, Matt Brauchler wrestled and decisioned his opponent to advance himself further in the wrestlebacks. 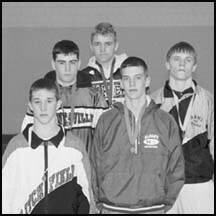 With the end of the fourth round, Paynesville had five wrestlers that had to wait to wrestle their final matches later on that day. However, many wrestlers were still trying to advance to the other medal matches. The fifth round was the round for all the wrestlers in the wrestlebacks. At 103, Nathan Glenz blew past his opponent pinning him in 38 seconds. This advanced Nate to the third place match. Jeremy Sogge wrestled at 119 and lost to a very tough DC wrestler. With this loss, he was put into the fifth place match. Joe Hiltner wrestled at 145 and defeated his opponent 8-2 to advance to the third place match. 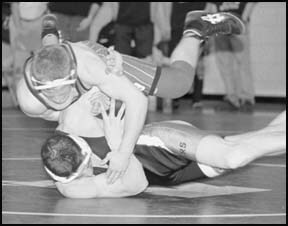 At 160, Shaun Fleischhacker pinned his opponent to advance to the third place match. Josh Bork also pinned his opponent at 189, to advance to the third place match. At heavyweight, Matt Brauchler wrestled great, but was shunted by a very tough Litchfield wrestler and was put into the fifth place match. With the fifth round done, the only round left was the finals. There was an hour and a half break between the two rounds, so the wrestlers had time to mentally prepare. Nathan Glenz came into the third place match ready to go. He faced a tough DC opponent and lost in a close match by two points. This gave Glenz fourth place. At 119, Jeremy Sogge wrestled a tough match, and majored his opponent 13-4. Sogge took fifth place. David Kerzman, left, wrestled a DC wrestler whom he was defeated by a week earlier. Kerzman did everything he could, but fell short to his opponent and lost the match, 13-8. Kerzman took second place which advanced him to state. At 135, Justin Mueller, right, won his match with a score of 3-2, over a DC individual to let him become region champion. Mueller also advanced to state. Chris Welle lost a disappointing match to a Litchfield opponent, bringing him second place. Welle was the third wrestler to advance to state. Chris Sogge went out at 152 and wrestled one of his best matches of the year. Sogge and his opponent were tied in the third period when Sogge threw him to his back and pinned him. This gave Sogge the first place, advancing to state. Shaun Fleischhacker wrestled a good match in the third place match. He fell short to his opponent in the end. Fleischhacker finished in fourth place in the tournament. Karl Sanborn wrestled at 171 and decisioned his opponent in the finals. Karl was seeded second, but got revenge on his opponent by defeating the first seeded wrestler. Karl earned first place, and was the fifth wrestler to advance to state. At 189, Josh Bork wrestled a tough opponent from Glencoe-Silver Lake. He lost by only two points, and fourth in the tournament. Matt Brauchler finished the tournament off for Paynesville. In his fifth place match, he decisioned his opponent, giving him fifth place for the tournament. With the close of the tournament, Paynesville had five individuals that earned a spot in state. 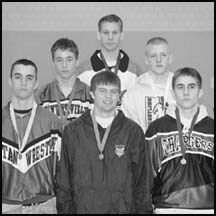 The wrestlers are: David Kerzman, Justin Mueller, Chris Welle, Chris Sogge, and Karl Sanborn.